It was in 1994, whilst living in Hong Kong, and experiencing a fast paced and environmentally stressful lifestyle, that Amanda first sought balance and completeness in her life. It was here in the country where she was raised that she began her journey with yoga in the form of meditation at the Raja Yoga Centre. In 1998 Amanda headed for American shores. She biked the coastline of California, tried new sports such as rock-climbing and surfing and began an asana practice in the Iyengar tradition. With the challenges that she had faced living in the big cities of Asia no longer there, along with her yoga practice Amanda had now found an environment conducive to maintaining a physically healthy lifestyle and she loved it. As well as physical health and wellness she worked on developing mindfulness in her yoga practice which along with her new found past time surfing helped bring equanimity and joy into her life. 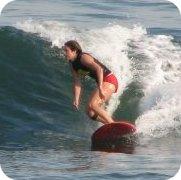 For Amanda surfing has become something other than standing up and riding a wave. It is a time to relieve stress, let go and feel humbled by nature, and the ultimate meditative experience. After a serious leg injury and the operations that ensued, yoga provided relief from pain and physical discomfort and led Amanda on the ultimate path towards rehabilitation. Her inspiration to deepen her practice came from experiencing for herself yoga's effectiveness and true healing power. She then felt compelled to share her belief in yoga with others and completed a teacher-training program studying ISHTA yoga with Alan Finger. ISHTA stands for the Integrated Science of Hatha - the physical practice of yoga that creates balance, Tantra - the yogic philosophy that recognizes the perfection in all beings, and Ayurveda - the ancient Indian science of healing. ISHTA also means developing a personal yoga practice that meets your individual needs. She finds yoga to be an invaluable part of her routine. It helps her regain her center, ground herself emotionally as a mother and perform better in her regular physical activities, such as swimming, bike riding and her greatest passion, surfing. Her personal practice and curiosity has allowed her to explore a number of yoga lineages. She enjoys the anatomical accuracy of Iyengar Yoga, the energizing qualities of Ashtanga, the healing nature of Restorative, Therapeutic, Yin and Viniyoga, the beauty and grace of the Vinyasa yoga practice. Amanda feels that the role of a yoga teacher is to provide expert guidance to a practitioner, helping them to fully utilize whatever unique tools and qualities they possess to develop their own individual practice to suit their needs. As a teacher she aims to cultivate a non-judgmental, safe environment, promote a student's mental and physical well-being, reduce suffering and share the love and benefits of her yoga practice with her students. Her goal is to be compassionate, patient, enthusiastic, approachable, articulate and possess a deep knowledge of human anatomy and the philosophy of yoga. Amanda is a qualified ISHTA Yoga Instructor and trained with Alan Finger in New York in the ISHTA tradition. She is also a qualified Prenatal and Postnatal Yoga Instructor having a completed a training with Jane Austin. Passionate about the therapeutic applications of yoga, Amanda is also a qualified Therapeutic Yoga Instructor and trained with Cheri Clampett and Arturo Peel. Read about Amanda and 13 other inspiring yogis in this edition of the national yoga magazine Fit Yoga. Also featured in the article are Rodney Yee, John Friend, Cindi Lee, Baron Baptiste, Mary Dunn, James Murphy, John Cavanaugh, Mark Blanchard, Dharma Mittra, Jill Satterfield, Christopher Hildebrandt, Gurmukh Kaur Khalsa and Shiva Rea. Also, see Amanda in an Athletic Yogi feature in Fit Yoga.